The most important step in bringing accountability to your team — be Consistent! If you don’t “inspect what you expect” … then some things will get done, but many will be forgotten. One of the most persistent complaints I hear from employees of small business is that “we don’t finish what we start” and that the owners/managers are always adopting the latest book advice or stuck in chasing shiny objects syndrome. Your team needs your consistent follow-up to help them (and you!) build the habits of professional management. This means committing to and having your weekly (or monthly) one-on-one meetings, your monthly business reviews and your quarterly business planning sessions. Lots has been written on the psychology of “change” and building habits– it takes 40 days, 10,000 hours of practice to be an expert, etc. But it’s not rocket science- make a schedule, stick to it, learn from your progress, refine what works for your team and your business and KEEP WITH. This continues my 6 part series on coaching for accountability (you can read Step 1 and Step 2 here). 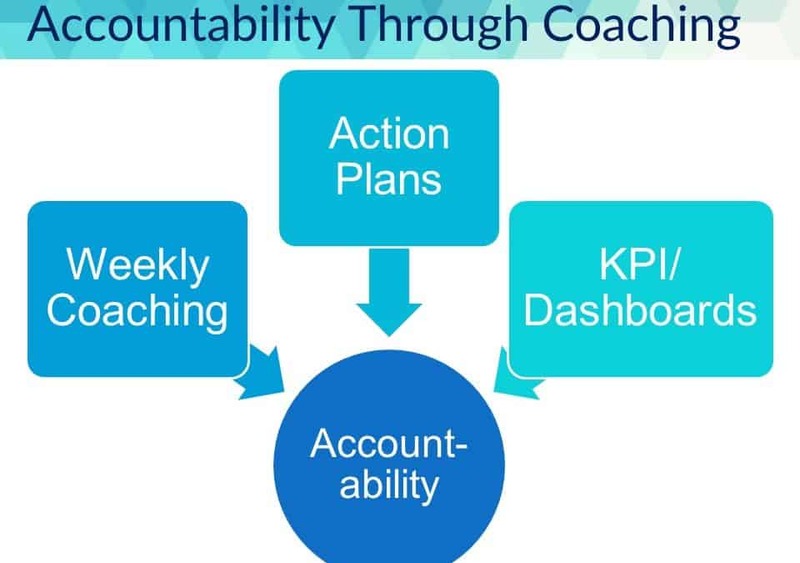 6 Steps to Coach For Accountability & High Performance [see all 6 steps on my 1 minute video slideshare]. Most employees (and also most managers) are naturally focused on getting their “day job” done. Their cognitive “time span” and time management skills are typically focused on the next day or next week. This is a major reason that all your good ideas and wish list of projects for improvement never get very far, much less implemented. The concept of an Individual Action Plan has personally been an incredible organizing and planning tool for my entire life, and changed the direction of our family business. When I was in high school, our family business started using a business consultant, who taught every one of our 25 employees how to create and use a personal action plan. My mother had 3 retail stores, two production facilities and a business services division with hundreds of accounts. 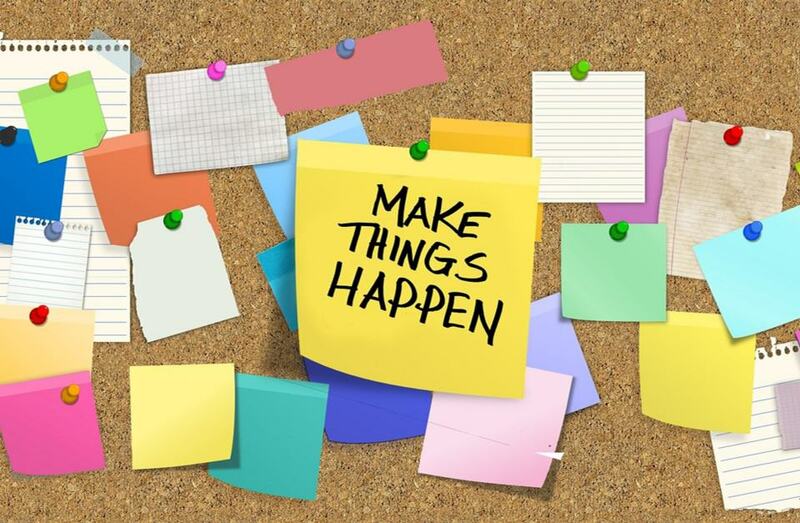 When every person had an action plan and they had “quarterly action plan meetings” they were able to focus on the daily work AND make progress on those pesky projects. It also made it easy to see how everyone was contributing and working together on business building activities. It made the difference between chaos and progress, and transitioned us from overwhelm to a professionally managed profitable business. 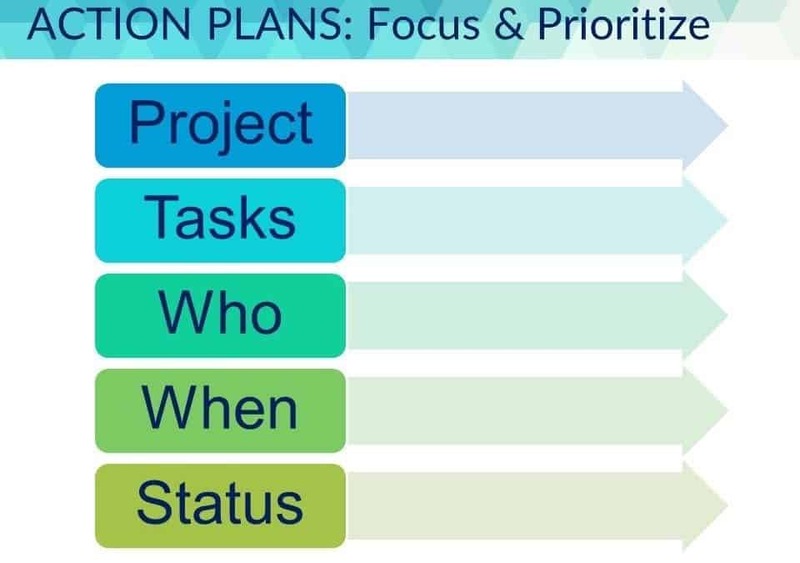 There are two inter-related purposes for action plans-– the first is to monitor and prioritize activities that support major projects or programs. The second is to use action plans as a training and development tool. I say inter-related because when people contribute to projects this contributes to their skill and competency development. Your employees want and need ongoing reminders and assistance with taking action on bigger projects, so that they make progress and focus on small steps every week. When they have a written action plan, and they review in your weekly coaching conversations, this helps them stay on track. If you don’t review and hold them accountable to make progress, anything beyond daily urgent work gets forgotten. Ideally you need to do a bit of design and discovery to begin the action plan process. Both of these topics become action steps on an individual quarterly action plan. What goes on an action plan? Research opportunities– what problem can they investigate possible solutions? Action plans also need to list specific action items, aligned with a broader goal, who is responsible, and a target date for completion. They are an integral part of aligning every team member’s work with the business goals, and to leverage the rhythm of weekly coaching with progress on business-improvement projects. As an added bonus, you will be building trust and the engagement of your team by focusing on the key drivers of retention. With the right topics and agenda, the quarterly action plan meetings become “stay interviews”– a technique that employers are finding valuable to hold onto their high performers. Next step I will share details on Step 4 “Delegate, Don’t Abdicate” [see all 6], and expect to have a new Guide to Coaching for Accountability by the end of this month. Read my last article on Step 1 to coach for accountability [clarify who does what]. Your employees want and need ongoing direction & feedback & support & recognition, so that they can focus on high priority actions. Just like a sailboat, if they drift just one degree off course every week they can end up going East instead of North. You need them to tell you when they are stuck, if they need clarification or resources, and to make more informed decisions. You also want them to make progress on projects beyond their daily tasks. Challenges- where are you stuck or need more help? I will be honest, the first few weeks are hard for managers to schedule, but then they find something miraculous …. When you think about all the time you spend on all these reactive activities, it adds up to well over 15 minutes per person. Would it be better to have a pre-planned time carved out of your schedule to be proactive, to give direction, feedback, support, recognition, and coach for learning and improved decision making and time management? If you have more than 10 people, over time you can designate and train a “team leader” to have these weekly conversations with the team and just bring you the weekly team updates [time saved 15 minutes x per person]. As an added benefit, this process develops your high potential employees into team leaders. As with anything that is “good for you” it takes a bit of effort to change your habits and the habits of your team, and diligence to keep consistency and progress. Managers who master this habit say they would never go back to their old ways. In my next article, I will share details on Step 3 “Action Plans for Development and Business Improvement” [see all 6]. 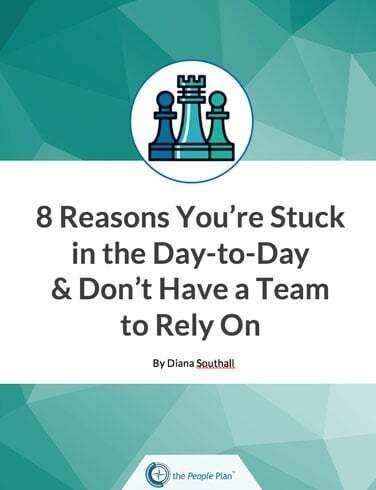 Are you interested in everyone on your team taking on more responsibility? I mean real responsibility — when they “own” the work, solve issues, make suggestions and even improve the process, and [the ultimate level] keep you in the loop with status updates or “exception” reports. This magical state is called the “Accountability Culture” — and blends the benefits of a Results Culture and a Caring Culture, and the top ranked most-effective leadership style that blends concern for People with a focus on Results. Accountability is not a new concept, but it has become a high priority for the business owner and manager who wants to spend more time on business planning and management and less time on getting the daily work done. If your team “does what they are supposed to do” then managers are freed up to work on the business- revenue generation, process improvement, cost control and great team and customer experiences. If your pants are on fire you can’t plan and improve your business. Let me be clear—- Positive Accountability is essential to grow your business. Last week I spoke to 91 planners and managers in operations, who work for companies with 50-500 employees. Guess what? These organizations are also challenged with building accountability on their teams. 6 Steps to Coach For Accountability & High Performance. you will not be able to effectively hold them accountable for results. 1. What is my role? 2. What does “good” look like? 4. What results should I produce? 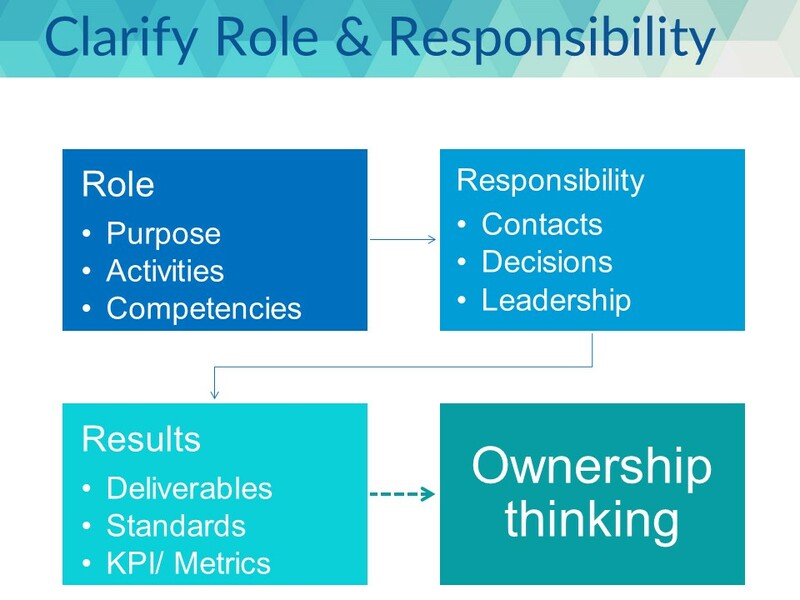 For a detailed outline of how to accomplish Step 1 [Clarify Roles and Responsibilities], see page 7. 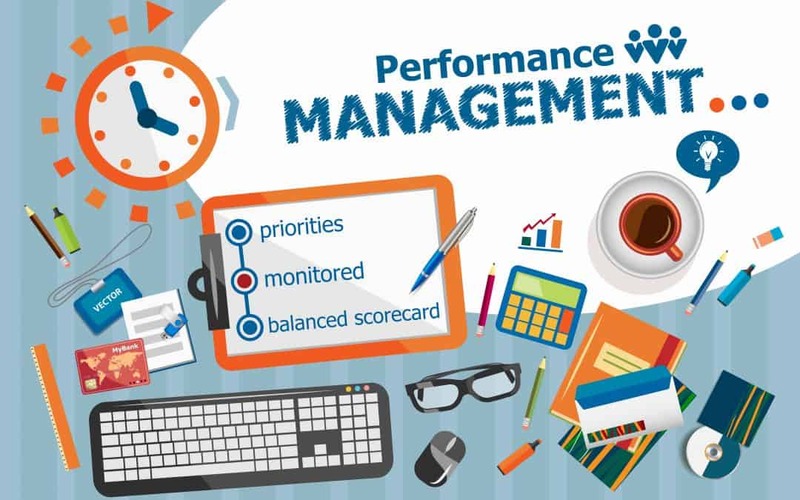 Determining the cause of a performance issue can be like being a detective– here is a list of 11 major reasons employees “don’t do the job” with possible solutions. Solution: I read many job descriptions—hundreds per year from dozens of organizations—rarely do they clarify for me the specific job activities and key results areas, much less how the job will be measured. It is difficult to hold someone accountable to results when the manager has not made it crystal clear what those results should be and what s/he has to do to get those results. Otherwise employees just take their best guess and do what seems to be the most urgent. Solution: Work with employee to identify skill or competency to enhance with training, create a training plan with a timeline and hold employee accountable to stick to the plan (even if it means reminding her manager to schedule the time or resources). Solution: Sometimes a little training can increase someone’s confidence and they become “comfortable” with the task and then perform it regularly. More likely this is a symptom of job fit—someone’s personality traits or competencies are not aligned with those required to excel in the job. A classic example is “asking for the sale”— a person who is cooperative (lower assertive) can be trained for years on sales techniques and given scripts, but he is always uncomfortable closing. For job fit, the remedy is to change the job duties to ones that correspond with the person’s strengths and attributes. Solution: Depending on the type of competency, the person may benefit from more training and development. However, many competencies are a function of personality traits that are ingrained and difficult to change even with extensive training. For example, “planning and organizing” is a set of traits and habits that your employee may not have and will be challenged to overcome in a role that requires tracking and pacing their work on month-long project. In many cases, the solution is finding a better job fit for the incumbent’s competencies. Solution: This is fundamental psychology. People do what is measured and recognized and rewarded. 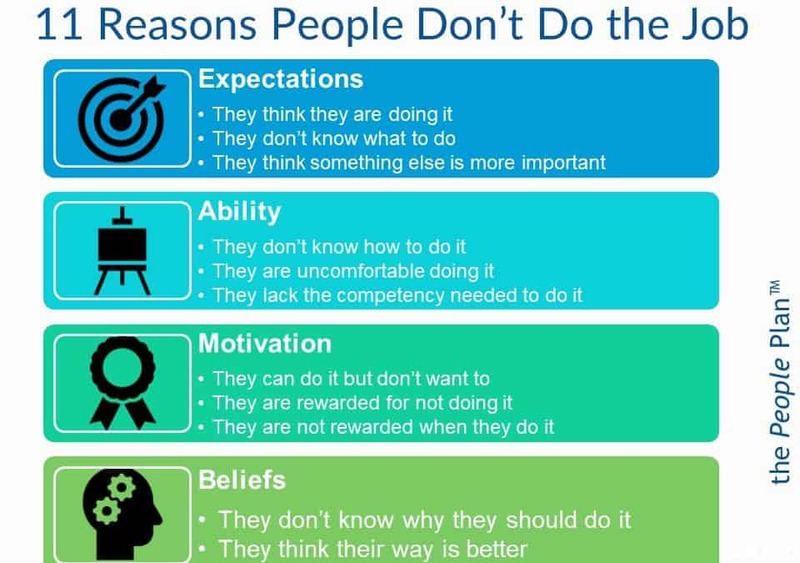 If they are not rewarded (or worse, “punished”) for doing something, most people stop doing it. Sales people don’t like to do paperwork—but they also don’t want to be reminded that they were late 9 of the last 10 weeks—this is powerful feedback. Often the signals sent by managers are unintended. Do you reward your poor performers by giving extra work to others that you can depend on? Do you remember to praise and even publicly recognize the team that worked last weekend to finish up a project? 11. They think their way is better. Solution: Read the solution above… plus this often happens when you ask someone who is good/ comfortable with the “old way” and now you have a “new way.” And in the beginning, the old way is better since an employee is more comfortable and competent in the old way. A big part of culture change and process change is to overcome the belief that the old way is better. A key personality trait is openness to new experiences and some people are not. They will cling to the things they know how to do. As a manager you will need to support and coach these employees through the pain and fear that comes with change. Recognize that this is more deep seeded than just a training issue, but a consistent personality trait or a cognitive filter (belief) and be patient and supportive, and work through changing the belief, not just behavior. 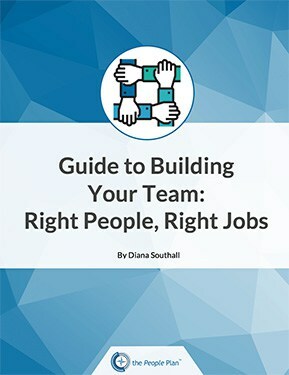 As a client’s manager once stated, “if we have 100 people then we have 100 different personalities.” It’s your job as a manager to figure out what is the cause and the solution that works for all the unique individuals on your team. In my last LinkedIn article, “Despite the flaws, don’t just stop your annual review”, I shared 5 articles and 3 books that explain why “everyone” hates the annual review process, BUT I cautioned just dropping this all together. So how can you give your team feedback in a positive way, that they enjoy, and that will ultimately achieve the intended goal to improve performance and engagement? This process takes the best aspects of the annual review (yes there are some beneficial aspects), and combines it with weekly coaching and feedback, with a dose of training and development planning thrown in for good measure. Companies who saw the best results didn’t stop the annual performance discussion, they shifted the focus to more of an overview of key learnings and jointly created development goals for the next year. When companies ADDED these three methods (together) to the annual discussion between an employee and manager, they saw improvements in strategic alignment, developing a performance culture, support of company values and strategy, and yes, increased company performance. Said another way, people like this process better and feel it is more effective on the things that matter– improving employee and company performance.